“There is only going to be one winner of the inaugural Grand Prix of Indy, and I want that to be me,” Castroneves said after completing 74 laps around the 2.439-mile/14-turn Indianapolis Motor Speedway road-course. 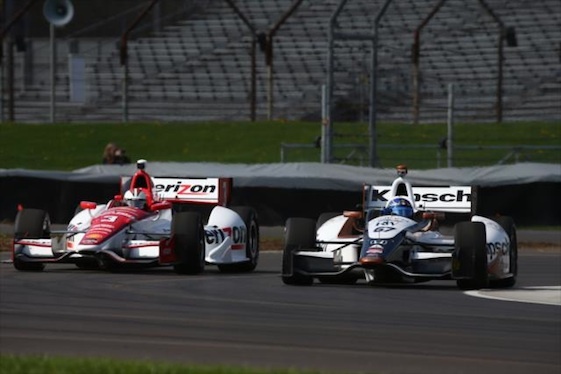 Reigning Indy 500 champion Tony Kanaan of Target Chip Ganassi Racing turned the ceremonial first lap around the circuit, and it didn’t faze the 24 drivers posting hot laps that they crossed the famed “Yard of Bricks” on the front straight in a clockwise direction. Five hours of track time provided drivers and teams an opportunity to set a baseline for Grand Prix of Indianapolis practice sessions on May 8, when lap times will be considerably more crucial. Three rounds of qualifications are scheduled for May 9, while the standing start for the 82-lap race is set for 3:43 p.m. (ET) May 10. Less than 24 hours later, practice will open for the 98th edition of the Indy 500 on the 2.5-mile oval. Three-time/reigning IndyCar Series champion Scott Dixon jumped to the top of the time chart on the last of his 46 laps at 1:09.5969-seconds/126.161 mph. Ryan Hunter-Reay, winner of Sunday’s Honda Grand Prix of Alabama, was fifth (1:10.0237-seconds/125.392 mph) in the No. 28 DHL Dallara/Honda for Andretti Autosport. The top 19 cars were separated by less than one second. Will Power, driver of the No. 12 Verizon Team Penske Dallara/Chevrolet and winner of the season-opener on the Streets of St. Petersburg, topped the morning session at 1:11.2128-seconds as teams and drivers made multiple adjustments to pair with the hardest compound of Firestone primary tires. Alternate red tires, which trade more grip for quicker degradation, will be available for race weekend at IMS. The new track received high marks for its flow and raceability, which will be enhanced when more tire rubber is laid in the turns. Section times produced 196 mph clockings down the front straight into the sharp right-hand Turn 1 and 184 mph on the Hulman Boulevard straight entering the left-hand Turn 7. Originally laid out for the Formula One U.S. Grand Prix run at IMS from 2000-07, the road course underwent a $5-million reconfiguration and infrastructure upgrade that includes new viewing mounds for spectators overlooking the oval’s Turn 2. Hundreds viewed the test day under mostly cloudy skies. The test also marked the first time that Justin Wilson turned clockwise laps at the facility since his 2003 Formula One appearance, when he finished eighth for Jaguar Grand Prix.